Frost tender evergreen perennial. Flat, green, sword-shaped leaves grow in clumps with slender flower stalks extending 2-3' above them. 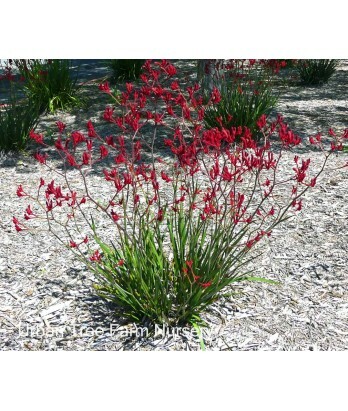 Fuzzy, deep red flowers are unique in shape - tubular, then curving out to ends that split into a finger-like appearance (resembling a Kangaroo's paw). Will bloom spring through fall if spent flower stalks are removed. Can be used as cut flowers. Light to moderate water needs in well-drained soil once established. Hardy to 20-25°F.